I was pretty ecstatic when I was offered the chance to review the new Sofia the First DVD. My soon-to-be four year old is a huge Princess Sofia fan, so I knew I’d have some company to watch the DVD with! When I received Dear Sofia… A Royal Collection, I noticed it said “FREE Letter to Sofia Kit inside!” What it contained, along with the DVD, was a little note to Sofia for your princess to fill out, a mailing enveloped and some stickers! My 4 year old quickly filled out the letter to Sofia and sealed it before I got a chance to see. While she was sleeping, I carefully opened it and saw she drew Sofia a picture and wrote her name on it! So cute! I sealed it back up with tape and clearly wrote our return address, as instructed, so we would hear back from Sofia! Onto the DVD! 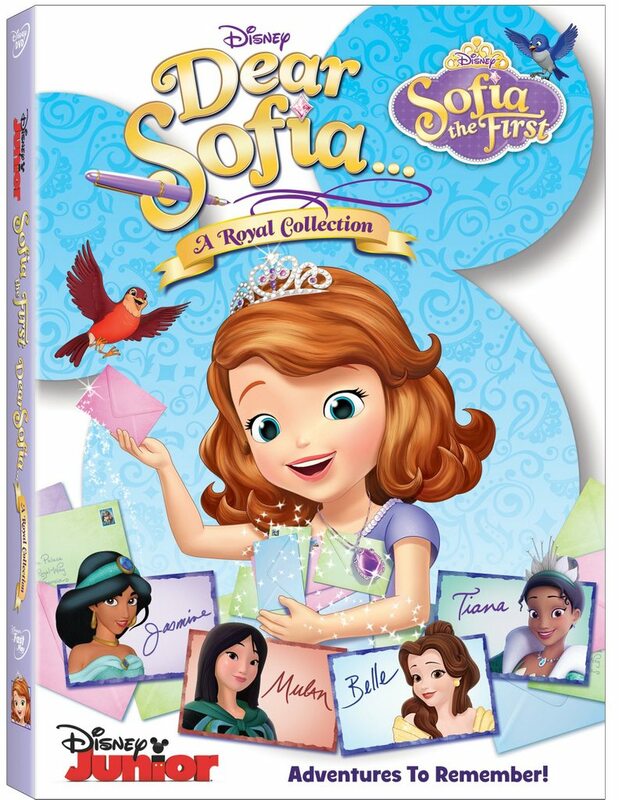 Dear Sofia… A Royal Collection includes six episodes, including ones with Belle, Mulan, Tiana and Jasmine. I had previously seen the episodes with Belle and Jasmine, but everything else was new to me! Running time is approximately 114 minutes. The DVD’s description says “Join Sofia on a daring adventure…” and it sure was! It was filled with all sorts of Princess Sofia goodness, cute songs my toddler enjoyed dancing along to, and sweet moments with some of our favorite “grown-up” princesses that my toddler adores. It’s not a DVD I’d sit down and watch on my own (like let’s say Up! or Ratatouille), but I definitely enjoyed watching it with my daughter who absolutely adored it. With the holidays creeping up, this would be a great gift for your little princess or prince! And with the extra addition of the letter kit, it gives it the extra special touch! A definite great find for any Princess Sofia fans. Disclaimer: We were given a complimentary copy of Dear Sofia in exchange for an honest review. All opinions expressed are our own. No other compensation was received. Affiliate links have been provided, but do not raise the cost of the product. Previous PostWDW Magazine 2016 Calendar Giveaway!! Next PostCinderella is now Available on Blu-Ray & DVD!